Just 400 metres from the Louvre Museum and the Tuileries Gardens, this hotel is a 5-minute walk from Place Vendome, public parking and 2 metro lines. It proposes soundproofed rooms with free Wi-Fi. 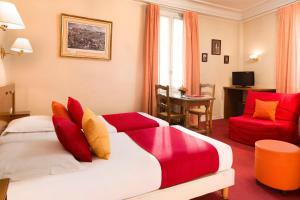 The air-conditioned rooms include a flat-screen TV with satellite channels. They all have a minibar and a private bathroom with a hairdryer. They are decorated in bright, warm tones. A continental breakfast can be ordered in the morning and enjoyed in your room, while you read the daily newspaper. In the immediate area you will find several places to eat. 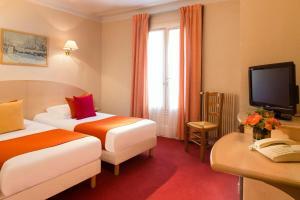 Hôtel Londres Saint Honoré is situated a 15-minute walk across the River Seine from the Musée D’Orsay. The famous Pont Des Arts is a 15-minute stroll away as is the Forum Des Halles shopping centre. Please note that the reception is located on the first floor accessed by a flight of stairs. The guestrooms are accessed by an elevator. 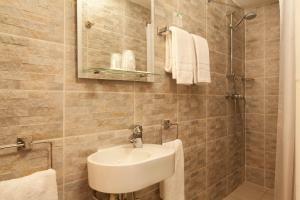 This air-conditioned room has a minibar, flat-screen TV with satellite channels and a private bathroom with a shower. This air-conditioned room has a minibar, flat-screen TV with satellite channels and a private bathroom with a shower and a bathtub.